A5, Active Monitor from ADAM in the A series. Product replaced by the ADAM A5X. Building on the A7, ADAM Audio announces the expansion of the A Series with the new A5 Powered Monitor and the Sub7 Subwoofer. ADAM tells us that technically, the A5 is a smaller version of the A7, and can be used either in stereo or to fill out a 5.1 surround system. Powered by 2X25W on-board amplifiers, the A5 combines ADAM's ART (Accelerated Ribbon Technology) folded ribbon tweeter with a 5" woofer constructed of a carbon fiber and Rohacell® sandwich. 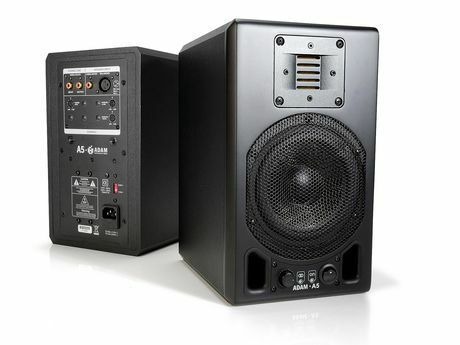 The front of the A5 sports dual ports for low frequency response down to 55Hz (can be extended to 30Hz with the addition of the new compact Sub7 subwoofer), metal grills for added durability, as well as power and gain controls. The rear panel includes balanced XLR jacks, unbalanced RCA jacks, and a new development by ADAM called Stereolink®. This new technology connects speakers with input and output jacks allowing the user to control the overall volume of the system from any one speaker's gain control. ADAM says that it was designed using the same technologies as the existing ADAM monitors, and that the A5's compact size and attractive price point of $699 per pair make it an excellent choice for a plethora of audio applications. The A5 comes in a choice of traditional ADAM matte black ($699 pr) or new glossy "piano" finishes in black or white ($769 pr). Optional wedge-like stands enhance desktop recording by allowing the A5 to be positioned at an upward angle. In addition to audio recording applications, the A5 is well suited to mobile and broadcast applications, desktop recording, and even multimedia uses such as gaming and home audio. ADAM Audio is also introducing the Sub7 ($479 matte black, $529 glossy black/white), a new compact subwoofer designed to compliment the A5. They say that despite its small footprint, it is capable of extending the frequency reproduction of the A5 down to 30Hz. Multiple inputs (both XLR and RCA) and controls that allow the system to be fine-tuned to any listening environment make the Sub7 the ideal partner for the A5. A wireless remote control for adjusting the volume and crossover frequency from the listening position is also provided. For more information, visit their web site at www.adam-audio.com. [Musikmesse] PreSonus StudioLive PreSonus Audio Electronics has announced StudioLive™ 16.4.2 Digital Performance and Recording Mixer. PreSonus Digimax D8 PreSonus has announced that the DigiMax D8 8-channel preamplifier with 24-bit ADAT digital output is now shipping. Drawmer M-Clock Plus TransAudio Group has announced the introduction of the Drawmer M-Clock Plus, an AES Grade 1 master clock generator.